Pride Month continues this June, joyfully celebrating the LGBTQ community and mourning the lost brothers and sisters in Orlando this past weekend. The Pride Parade will be dedicated to the 49 victims of the Pulse nightclub shooting, Pride Toronto announced today. “By dedicating the pinnacle of Toronto’s Pride Month celebration to our brothers and sisters in Orlando, we are telling the world that we will not be silenced or intimidated,” said Aaron GlynWilliams, Co-Chair of Pride Toronto‘s Board of Directors. The Parade, starting July 3 at 2pm, will begin with a moment of silence and a reading of the names of the 49 people killed and 53 people injured by a gunman in the early hours of the morning on Sunday June 12. For the full press release on the Dedication to Orlando victims, click here. For the full release on Rachel Lauren Clark and the Blue Jays, click here. Fancy a shave? Head to Shaw today! Niagara-On-The-Lake and Fleet Street merge this summer, when Sweeney Todd: The Demon Barber of Fleet Street starts next month. Steven Sondheim’s classic musical, an unlikely hit when it opened in 1979, blends horror and humour into a morbidly funny tale of revenge, reconciliation, and relationships. The story of Sweeney Todd has thrilled and unsettled audiences for decades. With previews starting July 17, the musical is sure to add a new slice of history to the Shaw Festival. For tickets to Sweeney Todd, click here! 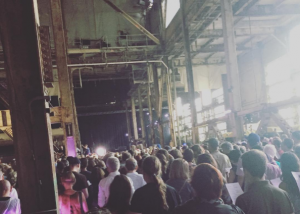 The Hearn is on, and Luminato is in full-swing! Since June 10, visitors have been wowed by the visual, auditory, and performative art that is the backbone of the festival. With rave reviews pouring in, the 10th anniversary of Luminato is already a hit with the audience. The takeover of the Hearn was called “a fairy-tale ending to the ongoing narrative of post-industrial decay” by the Toronto Star. The Unsound Festival, a pastiche of techno and deep house music, was hailed as modern meditation and musical abstraction. And the James Plays, the new trilogy of plays about Scottish history, opens tomorrow! Stay up to date on all of Luminato’s activities, and buy tickets by heading to their website! The Stratford Festival is shaking up the traditional this year, between their new productions of Shakespeare in Love, and The Lion, the Witch and the Wardrobe. Perhaps the most interesting is the new two-day cycle of Shakespeare’s historical plays. Breath of Kings combines four plays into two pieces. Rebellion is the epic drama following the stories of Richard II and Henry IV Part 1, and Redemption continues the political turmoil found in Henry IV Part 2 and Henry V. Excitingly, Breath of Kings will be performed individually and also in repertory for several days throughout the summer. Breath of Kings is steeped in the real historical reigns of British monarchs Richard II, Henry IV and Henry V. These rulers and their conflicts set the scene for the War of the Roses: a pivotal war of succession that shaped the future of England. Rebellion and Redemption open on June 22: for tickets to one or both of these shows, click on the links above! June 28 marks the unofficial start to the 25th anniversary season at 4th Line Theatre in Millbrook, Ontario, as previews for The Hero of Hunter Street kick off the season. Hunter Street, written by Maja Ardal and directed by 4th Line Artistic Director Kim Blackwell, follows a fictionalized account of a real tragedy in the region. The explosion at the Peterborough Quaker Plant in 1916 was one of the most traumatic and significant events in the region’s history. Ardal’s play commemorates the families and a city that struggled to rebuild, and masterfully recreated the vibrant community of Peterborough in 1916. The Hero of Hunter Street also marks the 100th anniversary of the devastating explosion. The Classic Theatre Festival will be sharing theatre from the golden age of Broadway all summer long. Starting June 24, head to Perth for classic theatre, local history, and even a ghost walk! The Festival kicks off with Neil Simon’s great I Ought To Be In Pictures. A heartfelt comedy about a father and a daughter, Simon’s play touches on the pain of disconnection and the awkward (and often hilarious) part of rebuilding an estranged relationship. Starring Alison Smyth, William Vickers, and Barbara Scheffler, I Ought To Be In Pictures runs June 24 to July 17. New this year to the Classic Theatre Festival are Pre-Show Talks. Included in the ticket, these talks will touch on the historical, social, and cultural contexts of their plays. Each one starts 30 minutes prior to the performances, so be sure to arrive early! To get your tickets to I Ought To Be In Pictures, or any of the other events, check out the Classic Theatre Festival’s website!